Bayern Munich forward Thomas Müller crowned his 250th Bundesliga appearance with the winning goal as the Bavarians beat Borussia Mönchengladbach 1-0 on Matchday 25. 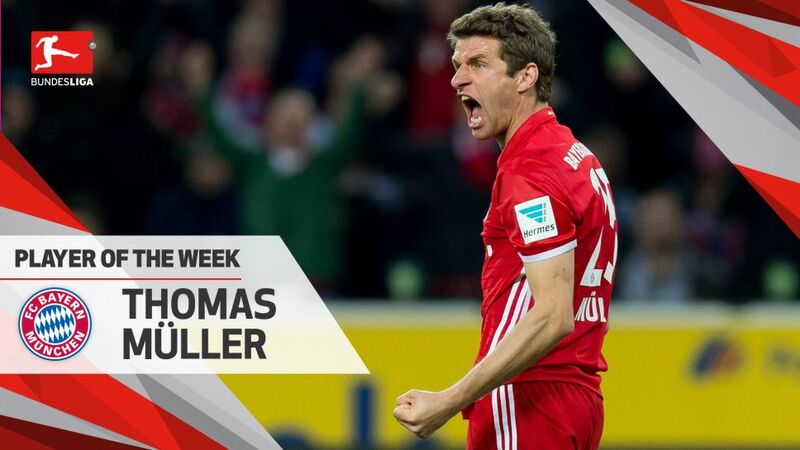 Click here to sign Müller for your Official Fantasy Bundesliga team! The Germany international had struggled for goals this season - he had netted just once in 22 league appearances before this game - but he made the difference will a coolly taken goal that sent his side 13 points clear at the top. The victory saw Bayern take another big step towards a fifth straight Bundesliga title, and helped the 27-year-old win his first Player of the Week award this term. Müller has now scored 93 times in 250 Bundesliga matches.Remarkably, the strike was only his second goal all season and his second in 18 appearances against Gladbach.Müller will link up with the German squad this week for matches against England and Azerbaijan. The 27-year-old will be looking to add to his 36 international goals.